(Nanowerk News) A combination of semiconductor catalysts, optimum catalyst shape, gold-copper co-catalyst alloy nanoparticles and hydrous hydrazine reducing agent enables an increase of hydrocarbon generation from CO2 by a factor of ten. “Solar-energy-driven conversion of CO2 into hydrocarbon fuels can simultaneously generate chemical fuels to meet energy demand and mitigate rising CO2 levels,” explain Jinhua Ye and her colleagues at the International Center for Materials Nanoarchitectonics in their latest report. Now the research team have identified the conditions and catalysts that will maximise the yield of hydrocarbons from CO2, generating ten times previously reported production rates ("Photocatalytic Reduction of Carbon Dioxide by Hydrous Hydrazine over Au–Cu Alloy Nanoparticles Supported on SrTiO3/TiO2 Coaxial Nanotube Arrays"). A combination approach increases the generation of hyrdrocarbons from CO2 by a factor of ten. 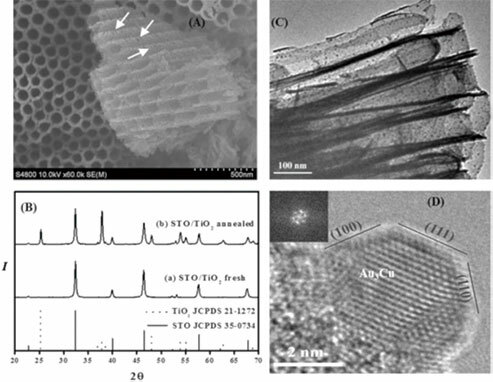 A) Scanning electron microscope image, the white arrows indicate the holes in the tubewall; B) Xray diffraction pattern of strontium titanate (STO)-titania (TiO2) coaxial nanotube arrays; C) transmission electron microscope image of Au3[email protected]/TiO2 nanotube arrays; D) High-resolution transmission electron microscope image and fast Fourier transform pattern of Au3Cu nanoparticles. Carbon dioxide can be converted into a hydrocarbon by means of ‘reduction reactions’ - a type of reaction that involves reducing the oxygen content of a molecule, increasing the hydrogen content or increasing the electrons. In photocatalytic reduction of CO2 light activates the catalyst for the reaction. Ye and her team introduced four approaches that each contributed to an increased reaction rate. First, they combined two known semiconductor photocatalysts strontium titanate (STO) and titania (TiO2) – which led to the separation of the charges generated by light and hence a more effective photocatalyst. Second, the high surface area of the nanotubes was made greater by holes in the tube surfaces, which enhances catalysis by increasing the contact between the gases and catalysts. Third, the tubes were decorated with gold-copper (Au3Cu) nanoparticle co-catalysts to further enhance the catalysis, and fourth, they used hydrous hydrazine (N2H4•H2O) as the source of hydrogen. Although the high hydrogen content of hydrous hydrazine is widely recognised in the context of hydrogen storage there are no previous reports of its use for reduction reactions. The researchers demonstrated that the reducing properties of hydrous hydrazine were so great that oxidation of the co-catalytic nanoparticles – a problem when water or hydrogen are used - was avoided.